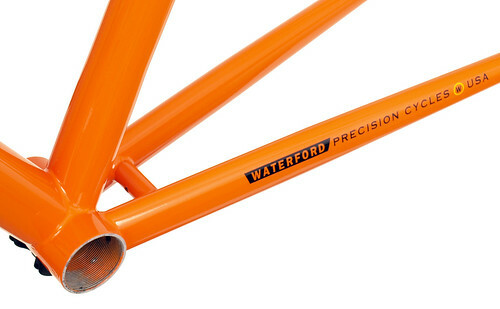 TIG-welded OS2 technology frames using Waterford’s extensive palette of tubes can deliver everything you want and more. 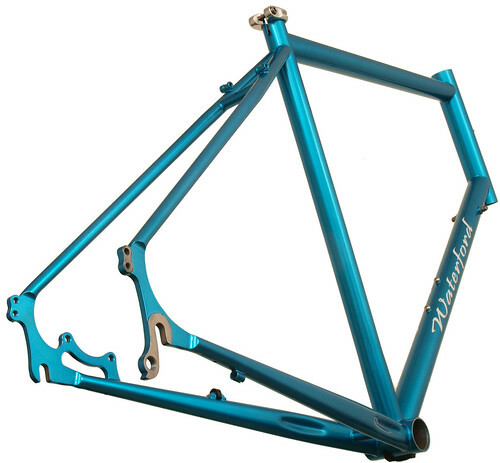 These frames offer impressive performance, combining light weight with tremendous strength. TIG-welded construction means the ability to create virtually any design imaginable. Our heat treated air-hardening alloys are specifically formulated to be TIG welded. We select each tube to match your specific needs and desires, factoring in your weight, desired handling, load capacity, riding habits and the expected terrain. Stainless steel dropouts come on virtually every OS2 design, whether it’s our standard road investment-cast vertical dropouts or track/fixed gear designs. We offer the full Waterford color palette with hundreds of stock finishes and nearly two dozen decal colors and styles. 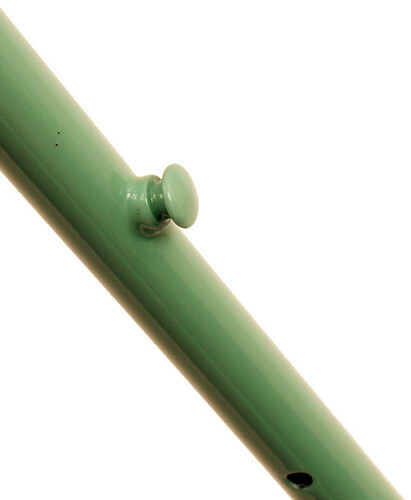 In addition, we offer a wide range of special finishes and special effects. 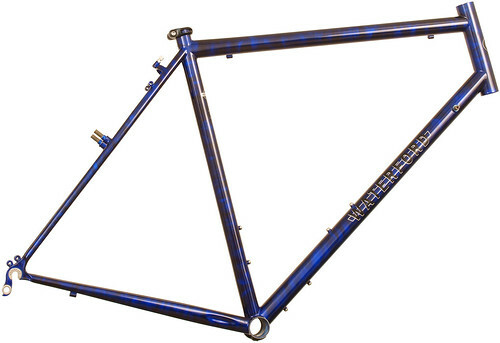 Waterford 14-Series Vision Design with Modular Disc Dropouts in Blue Flame. 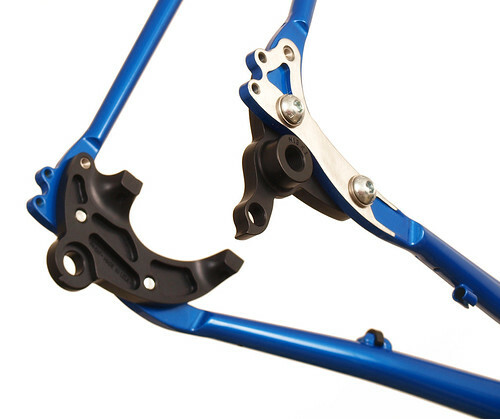 The modular dropouts lets you convert from quick release to through axle hubs. 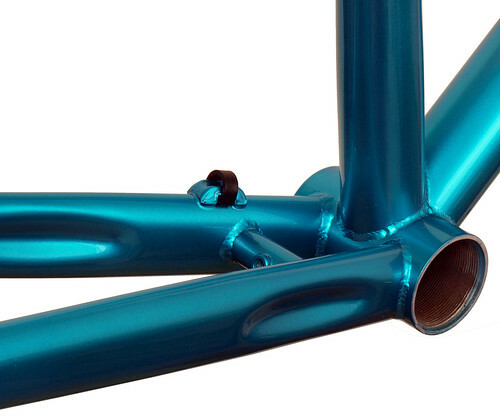 Also includes our new double bend chainstays for increased tire and heal clearance. 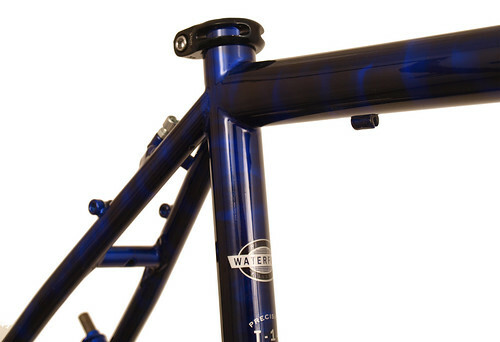 Waterford Modular Disc Dropouts in Blue Flame. 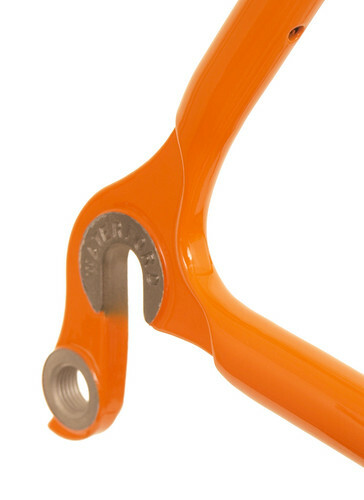 The modular dropouts lets you convert from quick release to through axle hubs. 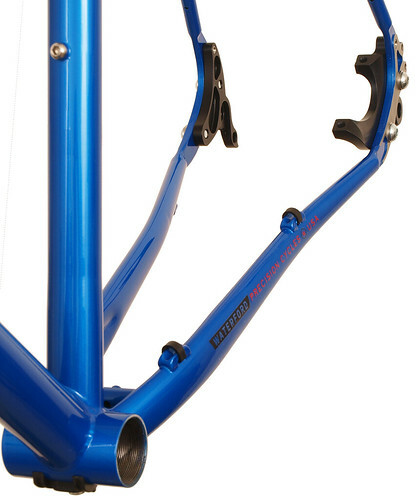 Also includes our new double bend chainstays for increased tire and heal clearance. 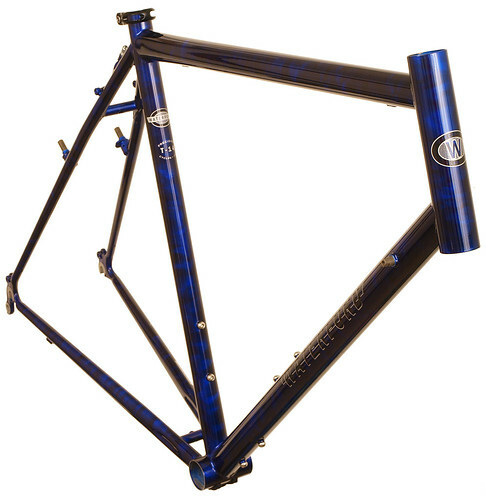 Front view of Waterford 14-Series Adventure Cycle with Blue Smoke Job. The Adventure Cycle is the choice for cross-country unsupported touring, with construction for load carrying, a fit for long-distance comfort and plenty of braze-ons for racks, fenders and water bottles. This one has a cool candy smoke paint job to boot, plus the classic block style black with silver Waterford decals. Waterford 14-Series Touring Design wth a Dark Candy Smoke Job. 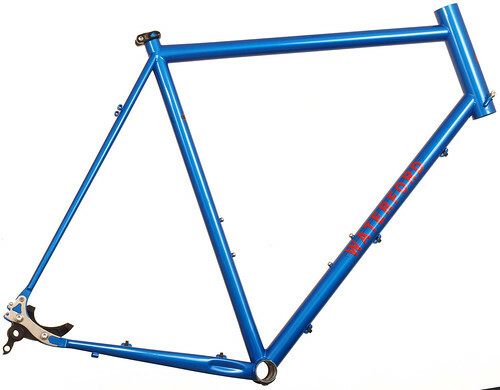 The T-14 is designed for long-distance unsuported touring, with sturdy construction, comfort fit and lots of braze-ons. This one has a cool candy smoke paint job to boot, plus the classic block style black with silver Waterford decals. Seat Cluster detail Waterford 14-Series Adventure Cycle with Blue Smoke Job. The Adventure Cycle is the choice for cross-country unsupported touring, with construction for load carrying, a fit for long-distance comfort and plenty of braze-ons for racks, fenders and water bottles. This one has a cool candy smoke paint job to boot, plus the classic block style black with silver Waterford decals. 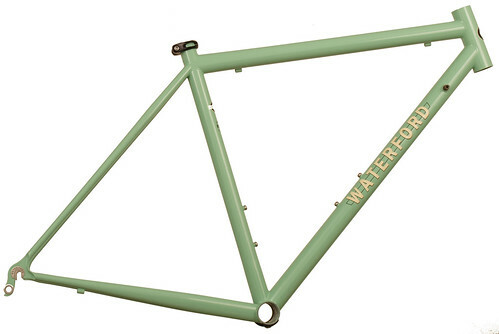 Waterford 14-Series Road Sport in Rock Moss Green with Ivory Block Decals. This simple, yet compelling color combination will attact looks with its understatement. 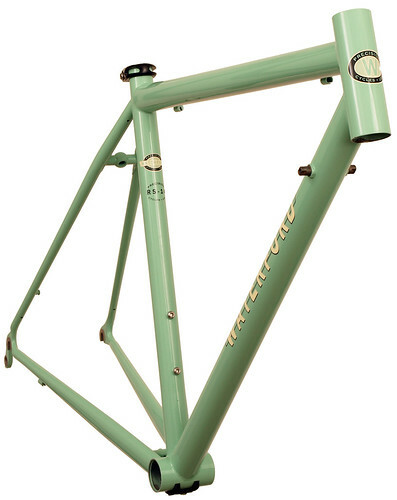 Front view of Waterford 14-Series Road Sport in Rock Moss Green with Ivory Block Decals. This simple, yet compelling color combination will attact looks with its understatement. 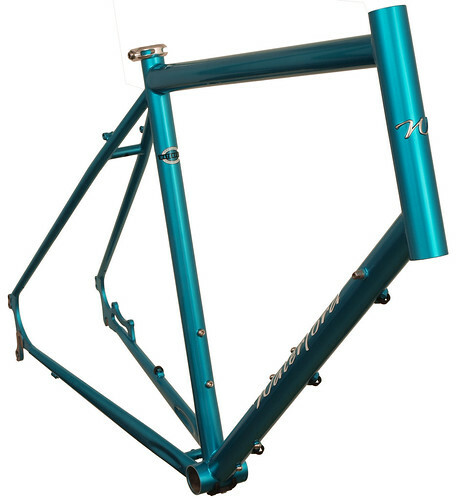 Chain Hanger on Waterford 14-Series Road Sport in Rock Moss Green with Ivory Block Decals. This simple, yet compelling color combination will attact looks with its understatement. 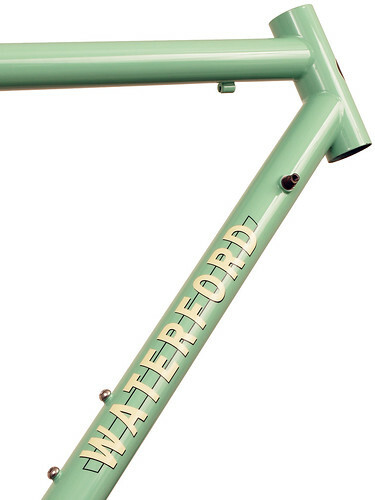 Front-end view of Waterford 14-Series Road Sport in Rock Moss Green with Ivory Block Decals. This simple, yet compelling color combination will attact looks with its understatement. 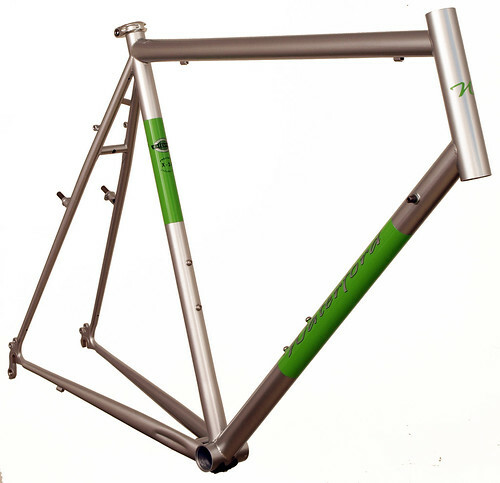 Front view of Waterford 14-Series Cross Bike in Sterling Silver with WIllow Green Panels. 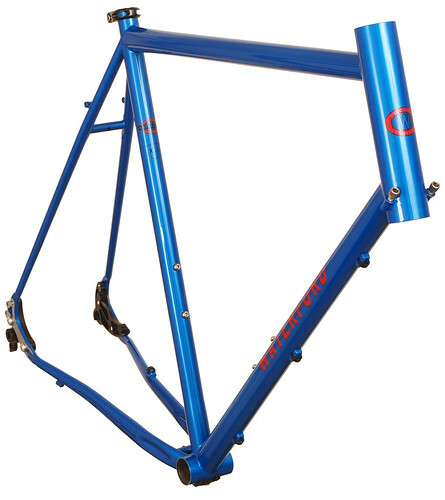 This custom design includes several handy features, including stainless dropouts, cable adjusting cantilever brake arch, rack mounts and, at the customer's request, double eyelets. 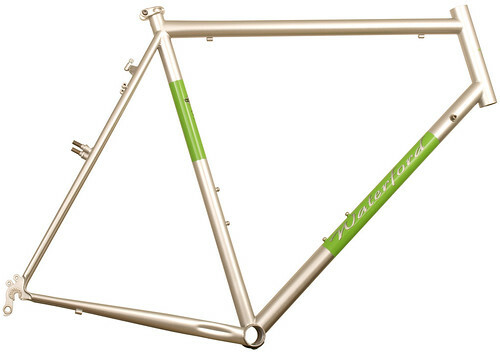 Waterford 14-Series Cross Bike in Sterling Silver with WIllow Green Panels. 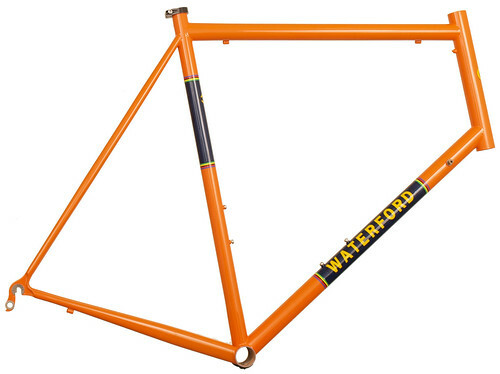 Waterford 14-Series Vision frame with 1980's Eddy Merckx Orange styling - 63981. 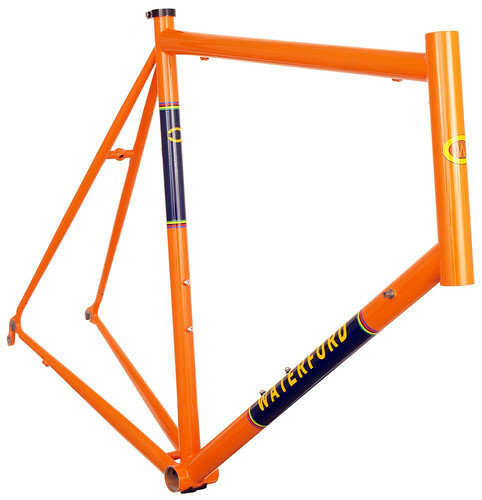 Bottom Bracket from Waterford 14-Series Vision frame with 1980's Eddy Merckx Orange styling - 63981.